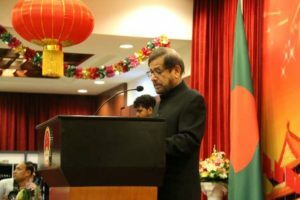 Probashbangla24 online Desk : China’s Belt and Road Initiative (BRI) has provided an opportunity to realise sustainable development and common prosperity of Bangladesh and China, said Cultural Affairs Minister Asaduzzaman Noor. “We consider China as a time-tested friend. Bangladesh deeply values its relations with China, and China remains our development partner to realise our development vision,” said the minister while addressing a reception marking the 69th anniversary of the founding of the People’s Republic of China at the Chinese Embassy in Dhaka. Chinese Ambassador in Dhaka Zhang Zuo also spoke on the occasion. Referring to the visit of Chinese President Xi Jinping in 2016, Minister Noor said the relations between Bangladesh and China have been elevated to strategic partnership of cooperation following that historic visit. Noor highlighted the bilateral relations in the areas of trade, commerce, investment, tourism, human resources, connectivity, health, education and cultural exchange between the two countries. Speaking at the program, Chinese Ambassador Zhang Zuo said they would like to maintain friendship with the people of Bangladesh for the future generations. Emphasising on expanding the scope for practical and friendly collaborations, the envoy said all countries are welcomed to join the ‘Belt and Road’ initiative with China. Referring to the China’s recognition to Bangladesh, the diplomat said both the countries are always in good relations since the recognition. He also mentioned Xi Jinping’s visit in October 2016 as the escalator of China-Bangladesh relationship.